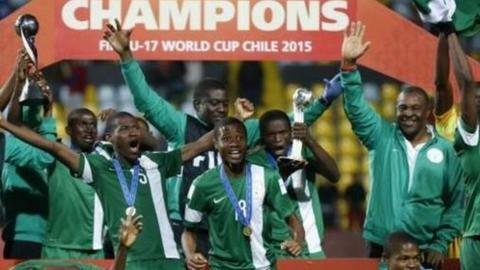 Nigeria retained the Under-17 World Cup on Sunday by beating Mali 2-0 in an all-African final in Chile. Osinachi Ebere had a penalty saved and headed the rebound against the bar and after the break Udochukwu Anumudu also struck a shot against the bar. On 56 minutes Victor Osimhen scored his 10th goal of the finals - a new record. Three minutes later Funsho Bamgboye added a second and ensured Nigeria became only the second country to defend the title. Nigeria coach Emmanuel Amuneke told Fifa.com: "We have worked very hard for this success and we hope to continue. "The players will go home now but their journey is not over yet. I have football in my blood, as a player and as a coach. This is what I want to pass to my players."